In 2015 I attended an event held in Manhattan, New York City. It was here that I first came across Haushala Creatives. 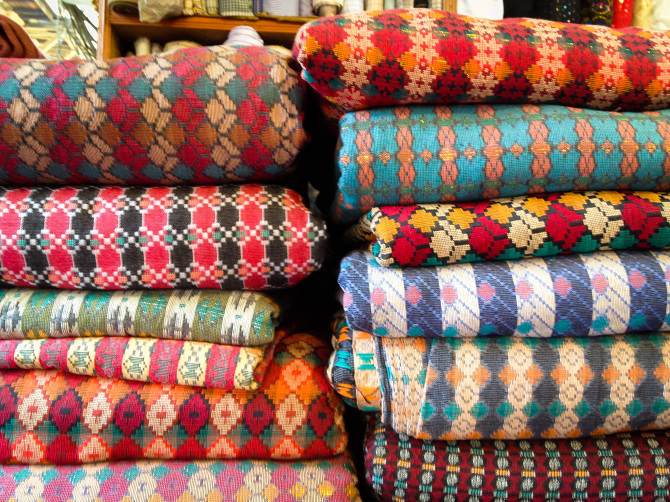 To my surprise, a familiar fabric seemed to be the recurring theme of their merchandise – the Nepalese Dhaka. I remember being overcome by a strange emotion, like I had somehow become misplaced in time and space – or in the words of Keanu Reeves: a glitch in the matrix! But all jokes aside, the sight of the Dhaka evoked a wistful sentiment; one that carried me thousands of miles back to the mountains, hills and plains of Nepal. The Dhaka always seems to belong some“time” else. Perhaps, in the black and white pictures of my grandparents – their hands folded into a Namaste, my grandfather with his Dhaka topi – a hat made from Dhaka, and my grandmother with her Dhakali Khasto – a shawl made from Dhaka. It is in these clothes that they planted rice in the muddy fields of Dharan or bid goodbye to their children who left for, either Kathmandu, or to become soldiers in the British Army. Similarly, in the memories of most Nepalese, the Dhaka appears again and again – a slice of life from here and a slice of life from there. The fabric is a part of our identity. Nepal of the present is a country in flux. But before there were expensive, brand-named stores of Durbar Marg, or the consumeristic frenzy of New Road, there was the simple but exquisite Dhaka. Woven on the wheel and the loom, the origins of the Dhaka can be traced to Kirati communities – especially Limbu and Rai women, from regions like Palpa and Tehrathum in Nepal. Traditionally seated on the floor, these women transformed cotton from local fields into yarn using the Charkha: the wheel. This yarn was then dyed and dried under the sun to be homespun into Dhaka using the Haate Taan: the handloom. This art of making Dhaka is passed down from generation to generation. In the olden days, preceding even the Rana rulers, the Kiratis were renowned silk farmers. In fact, some etymological sources claim that the name Kirat itself is a hybrid form of the word Kereta: the silkworm. Therefore, the skill of creating fabric sustainably from the earth, is a cultural heirloom of these Nepalese communities. And the Dhaka is simply an outstanding outcome of this very heirloom – no two Dhakas are ever the same. Interwoven between the colorful geometric patterns of the Dhaka, are spurts of individuality and creativity of its weavers. Unfortunately, the hand-woven Dhaka is slowly becoming obsolete. Today, it must compete with all things mass produced – ironically not only foreign but also domestic. Accounting for the skill and time required to traditionally create the Dhaka, costs must be significantly lowered for supply to meet demand. Thus, machine printed Dhakas are now readily available. Niraj Karki writes about the transformation of Dhaka production through modern supplements like the Jacquard looms and synthetic polyester. So now, if you walk through the utter chaos of Thamel, you can buy a Nepali Dhaka topi on the ground floor, at a price cheaper than a Dutch beer on the first floor. Oh Kathmandu! But the question at the core remains this: are the Nepali Dhaka and the traditional technique of creating it, worth preservation? I, for one, believe that they are. And my sentiment is probably shared by a lineage of people that are forever connected to me through my heritage – the Nepalese. The ability to make traditional Dhaka is rooted in this skill-set handed down to us; a sustainable gift of culture and economy. Like no two Dhakas are ever the same, there are no two social narratives that are ever the same – and this one is ours. Revering history is always a gray area – history is made up of both the good and the bad. But some aspects contribute to our identities in positive ways – this colorful fabric created from the earth of our homes, transformed by the labor of our mothers and aunts, to be draped over generations of our ancestors, is one. Thus, for me, the Dhaka is not a nationalistic or political symbol – rather it is a simple and constant reminder: I am here, but I am fromhere. My encounter with the Dhaka in the United States was electrifying. It made me realize that conservation is possible not only amid change, but also through change. Led by many social and non-profit groups, which place low-income women at the forefront of the production process, the narrative surrounding the Nepali Dhaka is rapidly evolving. The Dhaka is proof that is possible to conserve the traditional methods of production, while simply altering the outcomes of production. Usually, Dhaka does not follow the latest trends, but it embodies something deeper and more valuable – it is indigenous to us. The artisans at Haushala Creatives are preserving Dhaka and celebrating its history, all while uniquely incorporating it into new forms of expression. By handcrafting items like tote bags, passport wallets, and even iPad and laptop cases, the didis at Haushala Creatives are finding innovative ways to incorporate Dhaka into our everyday lives and to share it with the global community. And it's all for an important cause: to support the rights and prosperity of women, children and minorities in Nepal. Each time you purchase one of the Dhaka items from Haushala Creatives, the female artisan earns an income from half of the profits, and she donates the other half to pay the school fees of underprivileged children at Life Vision Academy in Nepal. That means each Haushala Creatives' Dhaka product combines traditional culture, modern styles, and social impact. Handmade in Nepal, with a piece of Nepali history, for a better Nepali future. To support the artisans in this mission, you can shop the Dhaka Collection here. Photo Source: StyleWise for Haushala Creatives.